An artist and an educator from San Diego, CA. The filmmaker caught up with her at Arizona State University Art Museum in Tempe, AZ, where her art piece, The Tag Project was on display. Her mother and father, Reiko and Bob Maruyama were also interviewed by the filmmaker. While they were not actually incarcerated in the American Concentration Camps, both of their families suffered profoundly during WWII, thus giving us a different perspective on this period of American history. The Tag Project is a deeply moving work of art which conveys the sheer number of people incarcerated in a most compelling way. Each tag represents a person who was sent to one or more of the ten concentration camps. Each tower represents one of the camps. Take a look at Wendy’s blog at wendymaruyama.com. A 17-year-old American citizen who was abducted by US government agents from his prison home in Topaz Incarceration Center in 1943. While quietly pursuing his artistic endeavors, Taneyuki Dan Harada was identified as a "troublemaker" simply because he was educated in Japan for some of his elementary school, thus labeled a Kibei. Kibeis were viewed as potentially dangerous by the US government because of their time spent in Japan, even though they were only children at the time. He continued painting while he was imprisoned at Leupp. When Leupp was closed, he was moved to the Stockade in Tule Lake Segregation Center. After having to go through such harsh treatment by the US government, he renounced his US citizenship. Watch this film to see what happens to him. 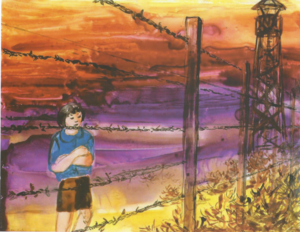 An artist and educator who spent more than 3 years of her childhood in Poston Incarceration Camp. She tells her war-time story through her collection of paintings called, Camp Days 1942–1945. A musician, artist, writer and community leader who has led a number of pilgrimages back to Topaz, Utah, where he was imprisoned with his family during WWII. He is a contributing author to the book Making Home From War: Stories of Japanese American Exile and Resettlement, and also From Our Side of the Fence: Growing Up in America's Concentration Camps.